Ancient Egyptian elements with modern twists, gather out on the patio or enjoy an intimate date with RA's extensive menu. 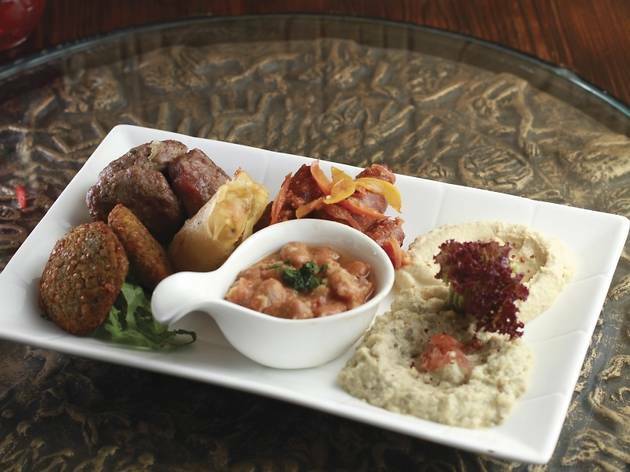 Finding a good Middle Eastern restaurant in Hong Kong is like stumbling upon an oasis in the desert. It doesn’t happen often and, most times, the food ends up tasting like a mirage of the real deal, with subdued spices and muted flavours tweaked to suit Hongkongers’ palates. So newcomer Ra has its work cut out. The restaurant favours alfresco eating with a small indoor venue that opens up into a much more spacious open-air dining and shisha-smoking area parked right on the waterfront. In case the giant eye of Horus plastered by the entrance isn’t enough to give away the style of nosh they’re serving, the outdoor patio comes with a towering statue of the restaurant’s namesake sun god. Yep – it’s Egyptian food you’re getting here. 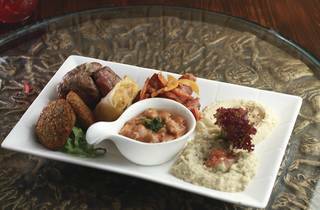 First-timers can get acquainted with the restaurant through the mezza sampler ($140) – a spread of seven different dips and nibbles served alongside a basket of warmed pita bread. The hummus is delicious – subtle with a nutty, tahini-fuelled aftertaste. The lamb kofta meatballs and merguez sausages also satisfy with their spicy tinge and smoky, grilled crust. Falafels are served with an unusually hard surface, which fortunately yields to a moist mashed lentil centre that’s scented with ample amounts of herbs and spices. From the mezza selection, only the babaghanoush disappoints with a lemon overkill that masks the aubergine’s natural sweetness. This eggplant dip would work better if it spared some of its acid for the tabbouleh salad (chopped parsley, tomatoes and onion, $50), which in turn lacks a citrusy kick. While starters are generally promising, some of the mains are too cautious with their seasonings and spices. The roasted lamb shank ($175) comes as two hefty bone-in portions resting on a bed of rice. The meat benefits from careful slow cooking and falls off in tender streaks. Unfortunately, the flavour doesn’t translate and the lamb is surprisingly bland for something that’s been cooked for so long. The chicken tagine ($150) tastes slightly better but the chunks of sautéed white meat are dry and the viscosity of the runny, herb-laden sauce is more suited to a broth. We flooded the accompanying side of fragrant and beautifully buttery saffron rice with the soupy sauce and were still left with more than half of it in the tagine pot. For those hankering for a tagine dish, go for the veal ($160) instead, which has a deliciously rich and chunky coriander-based sauce bathing tender pieces of milky meat. Shop 1, G/F, Wing On Plaza, 62 Mody Rd, Tsim Sha Tsui, 2721 3600. Mon-Fri noon-late & Sat-Sun 5pm-late. Dinner for two: around $500.